Thank you for considering Promised Hearts! It would be our pleasure to help you with your wedding. We value your confidence and your trust. We will offer you lots of suggestions; you do not have to use them. It is your wedding! We are dedicated to working hard for you. We offer Planning, Directing, Officiating, Rentals, Honeymoons, Invitations, Bar Tender Services, and more. Please ask us about our current specials and discounts. Contact us today for your wedding or event needs! We service all of Eastern North Carolina. We have a wonderful team; Promised Hearts has sole discretion in determining which member or members will be at your wedding. Requests for certain staff members will be accommodated as much as possible, but is not guaranteed. 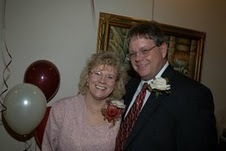 Pam DuVal and her husband, Joe Cadorette own Promised Hearts. Pam is a Master Wedding Planner in North Carolina (only about 75 worldwide), and a member of the Association of Bridal Consultants (ABC). She is also a non-denominational Ordained Officiant, a Certified Sandals Specialist, and she teaches the wedding planner class. Pam has also created a line of designer keepsake Marriage Certificates. Pam is a member of The American Association of Wedding Officiants (AAWO). Joe is a TIPS Certified Bar Tender. Promised Hearts is a charter member of the Eastern North Carolina Wedding Association (ENCWA). They have been creating happy memories for couples for over 10 years. They produced the Onslow Bridal Gala, an annual bridal show in Jacksonville, NC, for 5 years. In the event of bad weather, PH, along with the venue, will make determinations that are in the best interest of all parties involved. Email is our preferred method of contact as we both work other jobs and this keeps us all on the same page. Pam is NC’s first Master Bridal Consultant. The title has recently change to Master Wedding Planner. Pam & Joe work together to create what you want. We offer suggestions based on the couple’s personality. We guide, suggest, help in any way, but it is your wedding. Together we can make your dream day a reality! And we love weddings! Hello! Let me start by introducing myself, my name is Tatiana Goerler. I was both born and raised in North Carolina, mostly in Havelock. I’ve also live in Florida for 3 year but ended up back here, where I call home. My family tells me all the time that I have a little OCD in me, which I would have to say is true. Everything has its place and if its not there it drives me crazy. My husbands name is Michael Goerler, he works as an electrician. We have a 6 year old daughter name Lorelei. I have always loved watching wedding show but didn’t know I want to plan wedding till I was in my first year of college, at that time I thought fashion design was my calling but not so much anymore. I still love to draw and I’m very good at it but wedding planning is a better fit for me! I have already done three wedding since working for Promised Hearts and I feel more and more that I made the right decision.